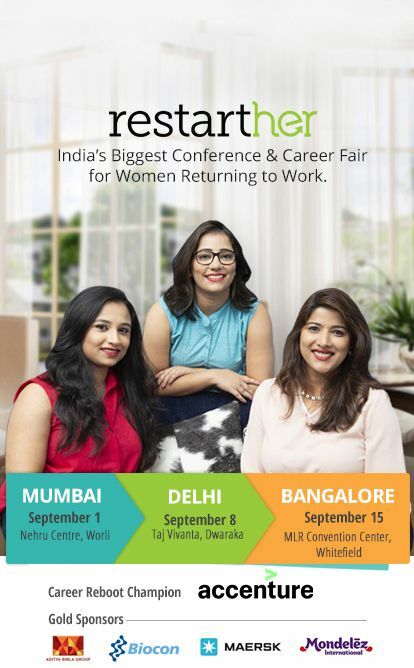 RestartHer 2018 - our flagship event - is the day that women on a career break reclaim their careers at India's biggest conference and career fair for women returnees. This year we will host the event in Bangalore, Mumbai & Delhi, in September. Last year, 3000+ women walked through our doors that day, and over 50 companies participated... It was just the beginning. An exciting and diverse mix of small, medium, and large companies will be at RestartHer 2018, all there to meet YOU - woman on a break - to show & tell you about their exciting and welcoming workplaces! An Exclusive Conference to Get You Back to Work! Join us at the RestartHer 2018 conference for a series of panel discussions with influencers from all industries to show you the endless possibilities for your second career. Leaders of industry sitting down at the table with you to discuss your career restart journey! Experts across diverse fields in a curated selection of workshops to give your career the professional polish it needs for lift-off! JobsForHer is a connecting portal to enable women to restart their careers after breaks and achieve their full potential. Our vision is to reverse female brain drain from within the Indian workforce. Our Team will get in touch with you shortly. Get in touch with Richa at +91 7619654174 or richa@jobsforher.com for any queries.